Two software programs that recently came to my attention, iAlertU and Laptop Alarm, represent a very usable shift in the world of laptop theft prevention. Instead of physically locking the laptop to an immovable object (requiring the user to carry, get out, and install a Kensington-like laptop lock), these programs work more like car alarms: mess with the laptop and you'll suddenly be made the center of everyone's attention thanks to as much sound as can be put out by the speakers and as much flashing light as can be accomplished by the screen. What's best is that these programs use existing hardware to get the job done, and in user-friendly ways. For example, Laptop Alarm can sound the alert if the laptop's AC power or USB mouse is unplugged, or if the computer is shut down or put in standby. This makes sense - these are things many users will be doing to set up their laptopping in the first place, so it's natural to use them as alarm triggers. 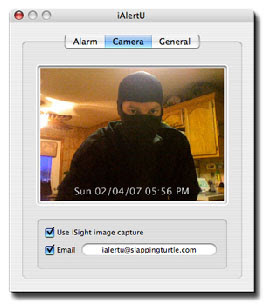 iAlertU, despite the toolish name, is even more fun: it uses the Macbook's sudden motion sensor to detect movement, and uses the built-in camera to snap and email a photo of the would-be thief to a preset email address. (Check out the video.) Heck, I'd almost want my laptop to get stolen, just to track down the culprit! When something as mundane as a laptop lock starts getting fun, it's a sign of some great design.